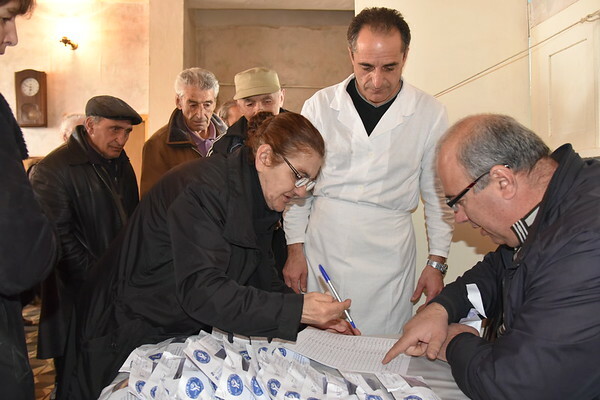 A busy circle of people gathered at FAR’s Gyumri Atinizian Senior Center on November 15th, where Hripsime Meliqyan, 59, Manvel Vardevanyan, 51, along with 44 others, waited to receive their new pair of glasses as part of Ayo!’s Care for Eye Care! project. “I had a pair of glasses, but I still couldn’t see clearly when I wore them. Today, they gave me two pairs: one for near-sightedness and one for far-sightedness. Now, I can see brilliantly,” said Manvel, who is currently unemployed and living with his elderly mother. Normally, Manvel works in construction. Recently, however, he’s had no luck finding a job. Since January, he’s been coming to FAR’s Gyumri soup kitchen at the center for his lunches five days a week. Early this year Manvel was able to receive a vision exam thanks to a joint effort between FAR’s crowdfunding platform Ayo!, and the Armenian Eye Care Project (AECP), which offered each of the 781 beneficiaries of FAR’s five soup kitchens in Yerevan, Gyumri, Nor Hajn, Byureghavan, and Berd, a free eye exam. More than 250 took the opportunity to do so, and 171 were found to need glasses. Ayo! raised $2,600 for the project, which also provided those in need of glasses with brand new pairs. Gyumri was the last location for glasses distribution to beneficiaries in need, which were brought there by FAR’s Soup Kitchen Program Coordinator Rafik Martirosyan. Some of those who received the glasses started wearing them immediately. Others promised to use them when they got back home. “I’d like to convey my gratitude to everyone who supported this project. Now, I can freely read my Bible which was very difficult to do before,” said Hripsime.